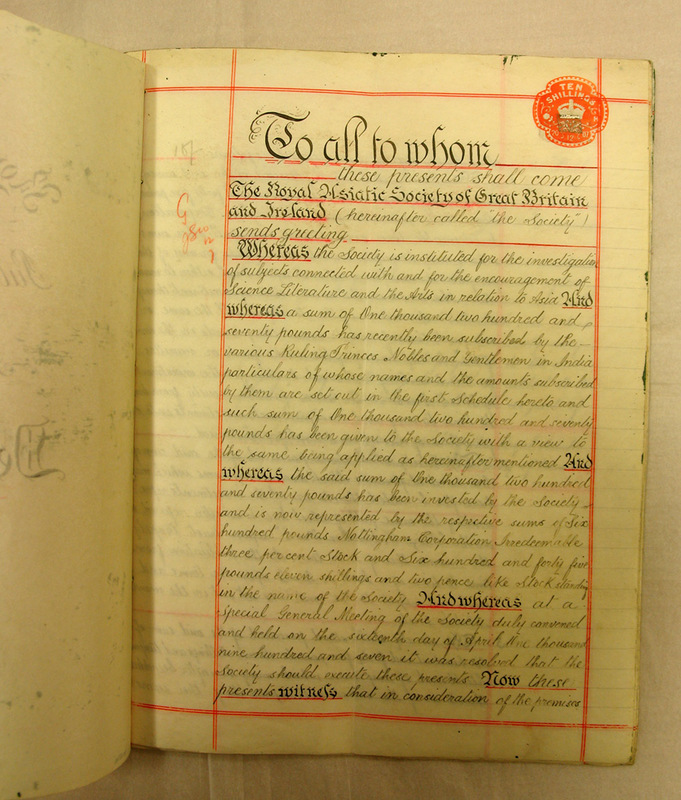 At the start of 2017, I began the process of sorting the Royal Asiatic Society’s Institutional Records. These date back to its beginnings and, of course, are still being made today and cover all the activities with which the Society has been involved through the years. In the last couple of weeks I have sorted the Papers concerning the RAS Public School Essay Prize and Gold Medal and the Universities Prize Essay . 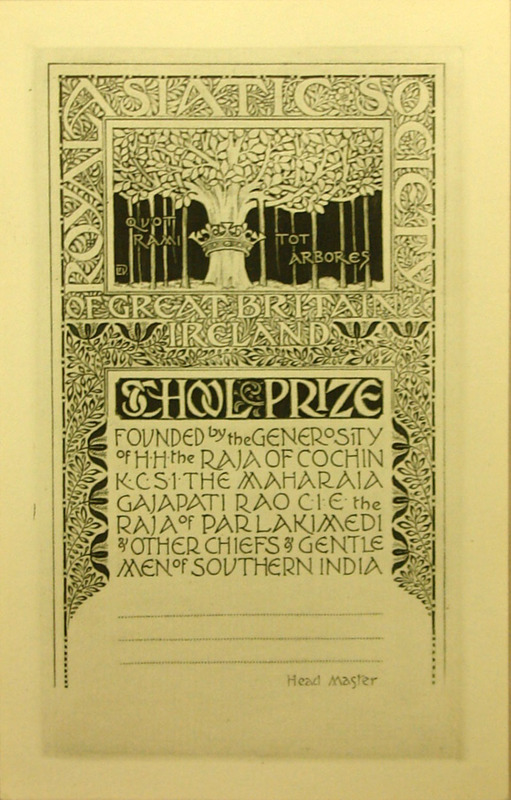 The prize began in 1907 thanks to the generosity of “His Highness the Raja of Cochin, the Maharaja Gajapati Rao, the Raja of Parlakimedi and other Chiefs and Gentlemen of Southern India” and was originally aimed at pupils of British Public Schools. The Declaration states that one thousand two hundred and seventy pounds was raised to be invested for the prize fund. 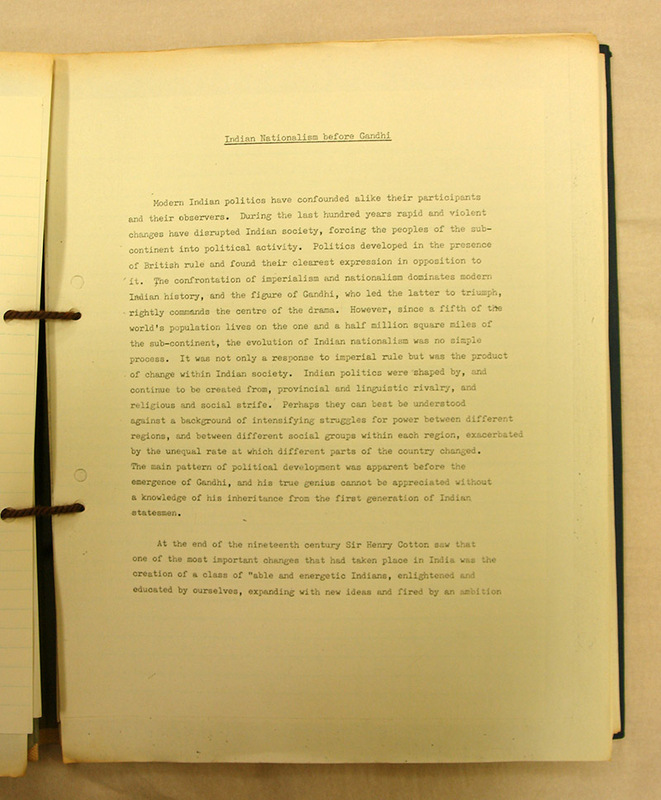 The essay, of 3000-7000 words, was to be on a subject related to India. Each entrant had to choose a “motto” so that they could not be identified by the examiners. 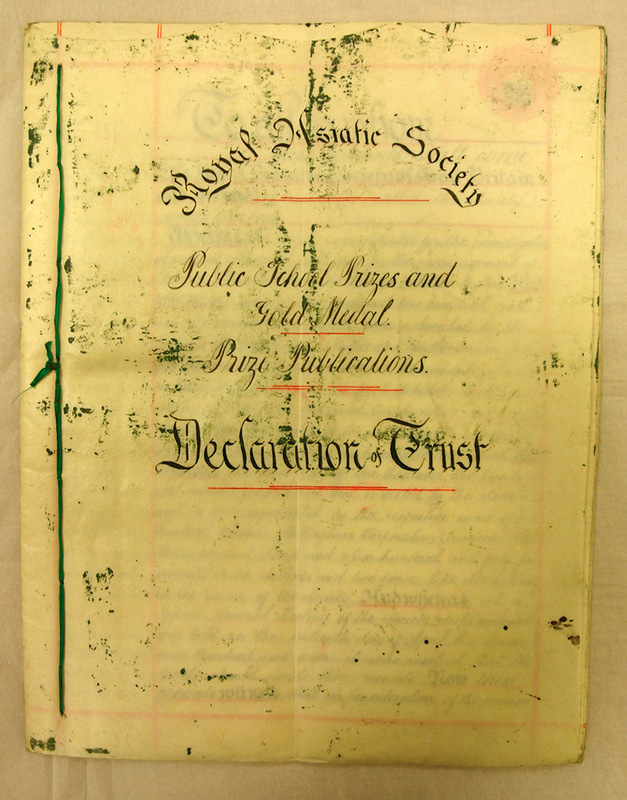 The winner, at the outset, was awarded a prize of books to the value of £2 and a Gold Medal with the inscription, “Royal Asiatic Society: Indian Empire School Medal”. No pupil could win the prize more than once and, initially, only pupils from Eton, Harrow, Winchester, Rugby, Charterhouse, Westminster and Merchant Taylors were allowed to enter. 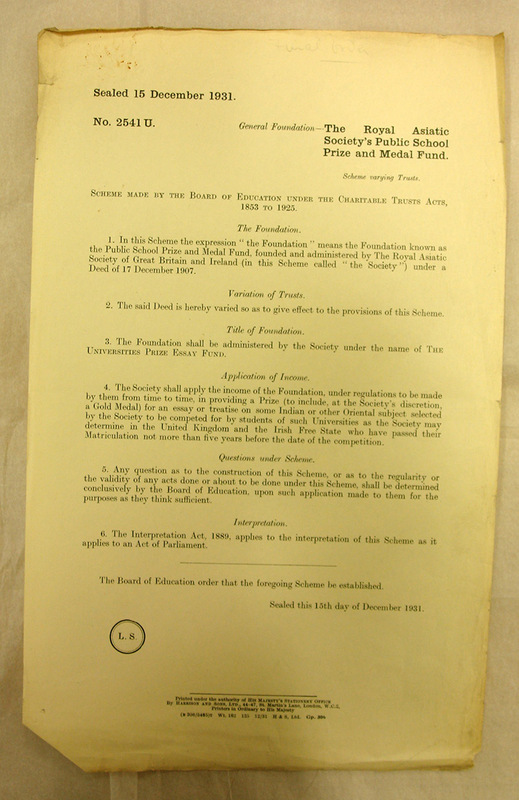 This prize was first initiated in 1907, but in 1931, the Society applied to the Board of Education to change “the Foundation”, i.e the Public School Prize and Medal Fund, to be administered as “The Universities Prize Essay Fund” and for the topic of the essay to be expanded to being on “some Indian or other Oriental subject”. This change was accepted and authorized on 15th December 1931. 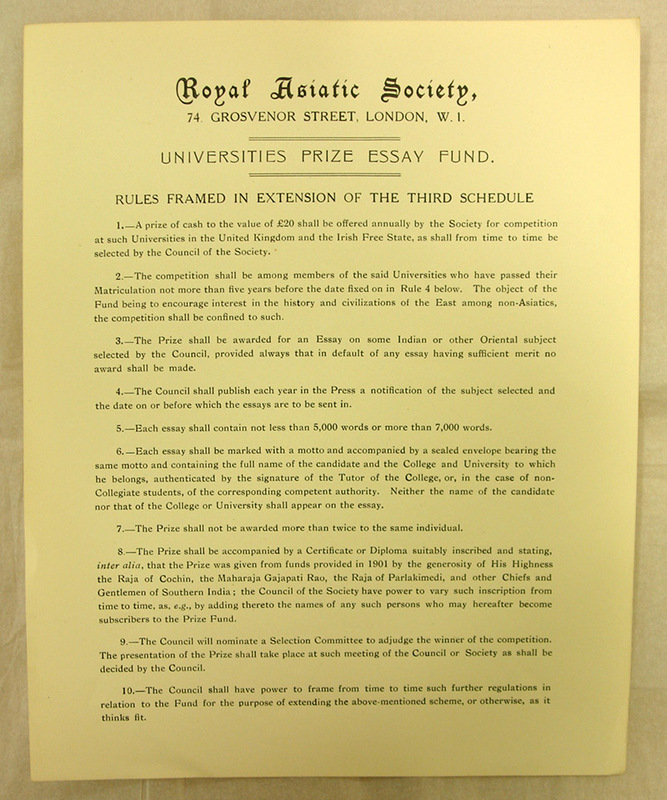 This time the competition was open to members of “such Universities in the United Kingdom and the Irish Free State, as shall from time to time be selected by the Council of the Society”. They must write an essay of between 5000 and 7000 words and the winner would be awarded a £20 cash prize with accompanying Certificate or Diploma stating the benefactors of the prize. 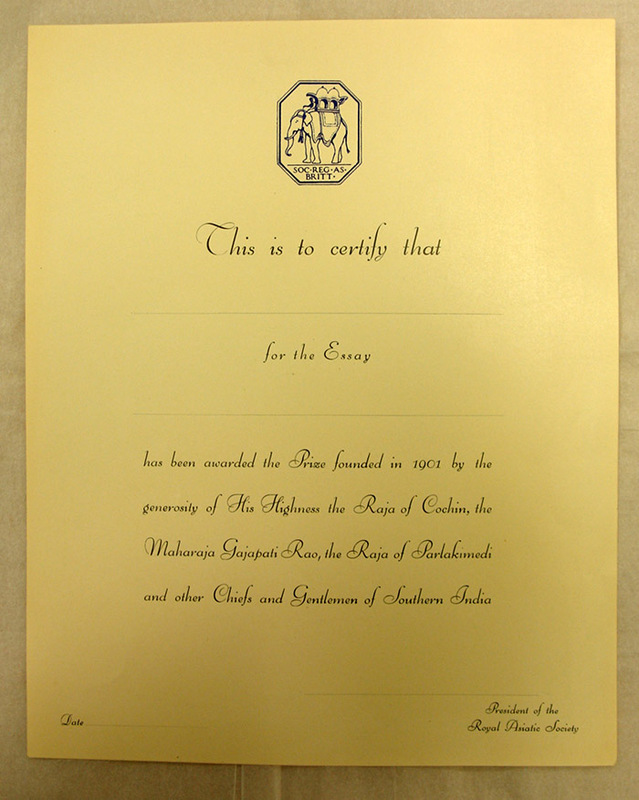 The first prize was awarded in 1933 to Norman Richard Seddon of Balliol College, Oxford, for his essay on “The Advantages derived by India and England for their mutual relations”. Mr Seddon was unable to receive his prize and diploma in person, as by the time it was awarded, he had graduated from Oxford and was working in Baghdad. Norman Seddon went on to have an illustrious career with British Petroleum eventually becoming one of the company’s executives. The said scholar entered an essay on “Indian Nationalism before Gandhi” and was awarded a half share of the prize fund with P.A. Khoroche who wrote on the “Turanians in the Avesta”. 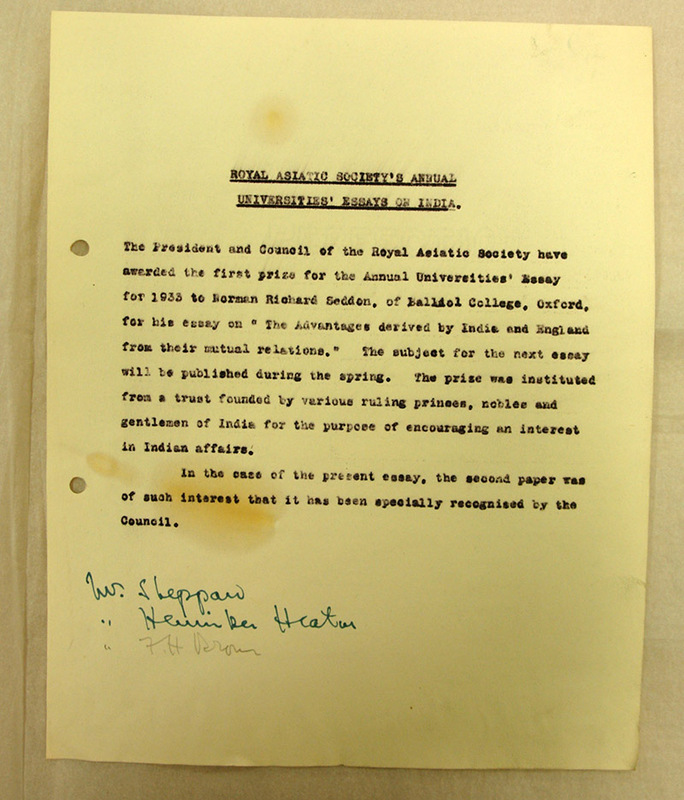 This essay competition, thus marks the start of our current President’s association with the Royal Asiatic Scoiety – one for which we are grateful continued in his later life. 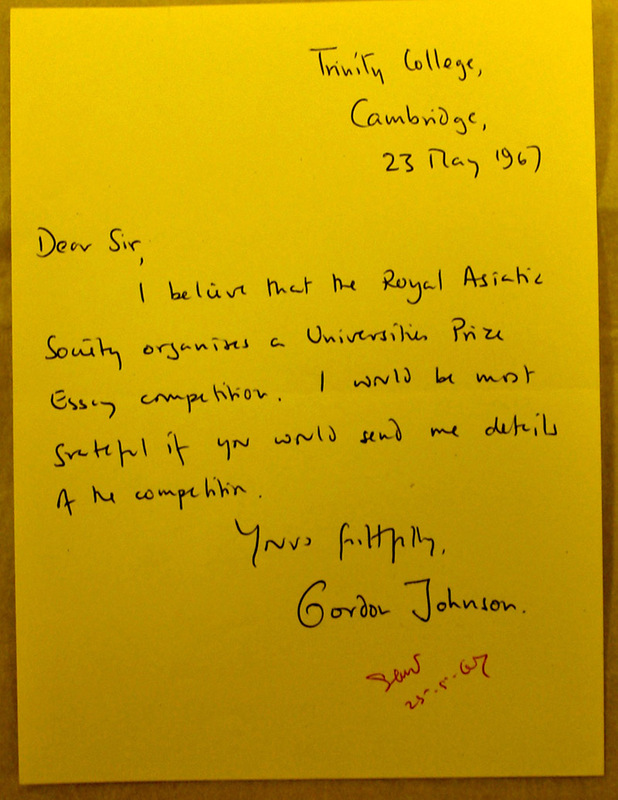 Gordon Johnson’s letter acknowledging his prize. The archives hold many of the original prize-winning essays including that of the 1967 joint winner, P.A. 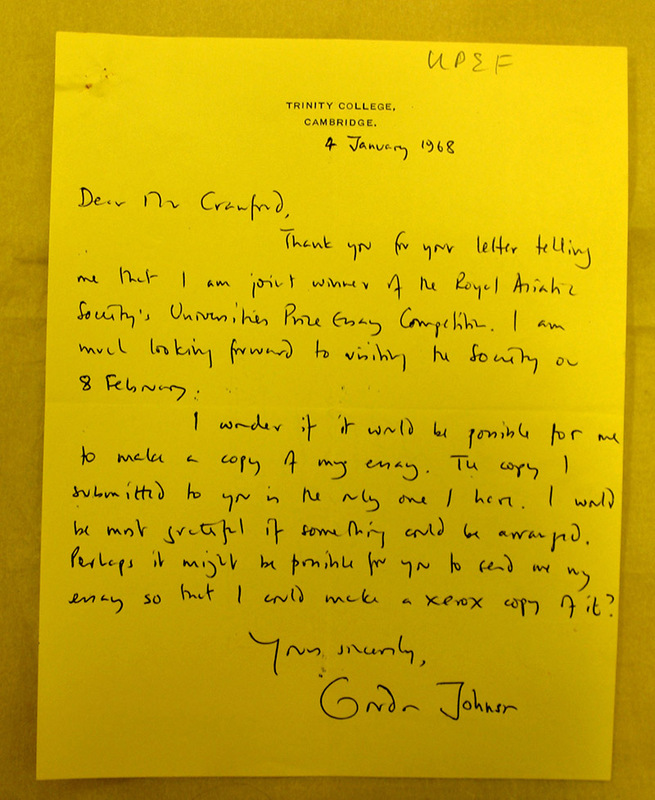 Khoroche, but sadly no essay belonging to Gordon Johnson. I contacted him on the off-chance that he might still have a copy and I am pleased to be able to report that not only was Dr Johnson able to find a copy of the essay but that he has also generously allowed it to become part of the archive. It appears that the last time the Prize was awarded was in 1975 when David Helliwell was awarded the prize for his essay, “What were the aims of the New Text Confucians in the former Han Dynasty?” I suspect, though do not know for sure, that this prize-winner may be the David Helliwell who is Curator of Chinese Collections, Bodleian Library, Oxford. The current Sir George Staunton Prize now fills the remit that once belonged to the Universities Prize Essay Award. It has been interesting to learn more about some of the Society’s activities through sorting this archive. This week I have turned my attention to a small set of Personal Papers belonging to the sculptor, Dora Gordine. Again, this has been really interesting to learn more about her and her connection with the RAS. This I will share in a future blog.